Morning Coffee & Afternoon Tea: Drink Yer Cocoa, Stay Alive! Drink Yer Cocoa, Stay Alive! Man I've been having such a busy week. I really thought today was Chocolate Friday (wishful thinking .... please, please, hurry up and be Friday) so I was going to post this link I found about cocoa. 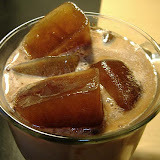 What the hey, nothing wrong with multitudinous choco-blogging! 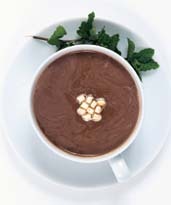 Cocoa has been linked to cardiovascular health benefits since at least the 18th century, but researchers are just beginning to collect scientific evidence for these claims, according to background information in the article. Cocoa is now known to contain chemicals called flavan-3-ols, which have been linked to lower blood pressure and improved function of the cells lining the blood vessels. The link between chocolate and overall lower risk of death suggests that other mechanisms also may be involved. "Because cocoa is a rich source of antioxidants, it may also be related to other disease that are linked to oxidative stress (e.g. pulmonary diseases, including chronic obstructive pulmonary disease, and certain types of cancer) ," the authors conclude. "However, this merits further investigation." I'll volunteer for research duty! Where can I sign up?? ?